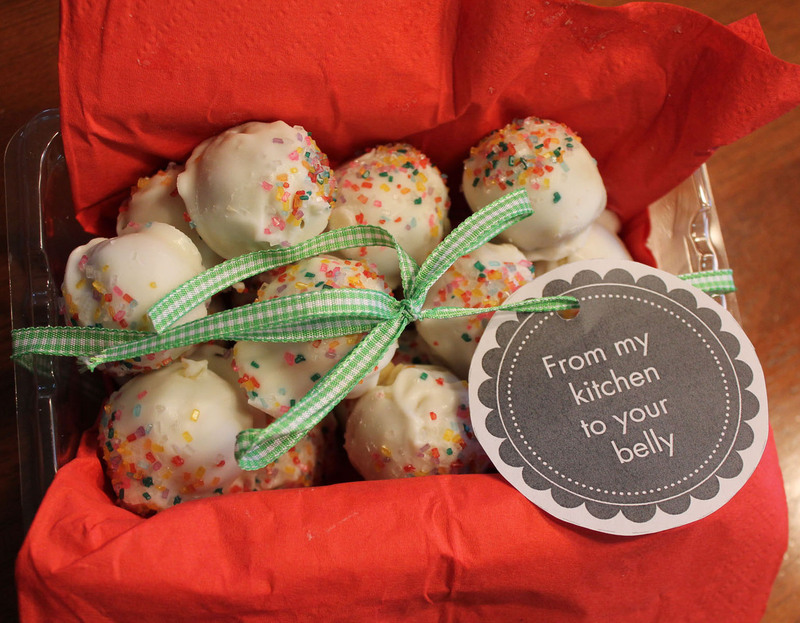 I made some cake batter truffles for a friend and wanted to package them in a creative and cute way. So.. this is what I came up with. I cut the top off a plastic strawberry container. I lined the “basket” portion of the container with tissue paper and placed the truffles inside. I found some ribbon and wrapped it around the container and finished it off with an awesome gift tag I found on Pinterest. So these gift tags looked so cute and I was bummed because I had to print them in black and white. I’ve been wanting a color printer for some time. There are so many cute printables on Pinterest and they would look so much better in color! I hit my breaking point and finally bought a color printer, so my next project will be in color. So excited! Linked up “Strut Your Stuff” Six Sisters’ Stuff (#262) on 5/12/12. Cake Batter Truffles – Yummy!